Patton Oswalt gave fellow comedian Tig Notaro a much deserved boost four years ago by publicly praising her decision to confront her personal crises on stage, particularly a recent diagnosis of breast cancer. Friday at Mystic Lake Casino, it was his turn. Oswalt's star has steadily risen in recent years, thanks to a finely honed live act and guest appearances in everything from "Parks and Recreation" to "Justified." Earlier this year, he won an Emmy for his stand-up special. In April, his wife, Michelle McNamara, died, apparently from an accidental drug overdose, leaving him a widower with a 7-year-old daughter. Oswalt has performed only sporadically since the loss. While he told the New York Times recently that he planned to address his grief in his act, it was unclear Friday if he would get there, especially in the wake of the presidential election. He spent the first half hour of his 70-minute act in semi-shock over Tuesday's upset, occasionally trying to engage Donald Trump supporters in the audience with what appeared to be genuine interest. His curiosity didn't stop him from delivering scathing bits, many of which he appeared to have just jotted down on a folded piece of yellow-pad paper, including one in which he compared the country's decision to a divorce-court judge who grants custody to "fun" dad who has a jet ski, but serves his children bacon for dinner because he forgot to go shopping. "Change it up!" heckled one spectator, apparently tired of either Oswalt's liberal bent or political talk in general. "I'm delaying the ... inevitable," he said. What followed was a soul-baring, painful and -- believe it or not -- hilarious 30 minutes on grief, touching on such matters as the worthless nature of self-help books, his bouts of uncontrollable sobbing and how losing a loved one is never like it is in the comics. 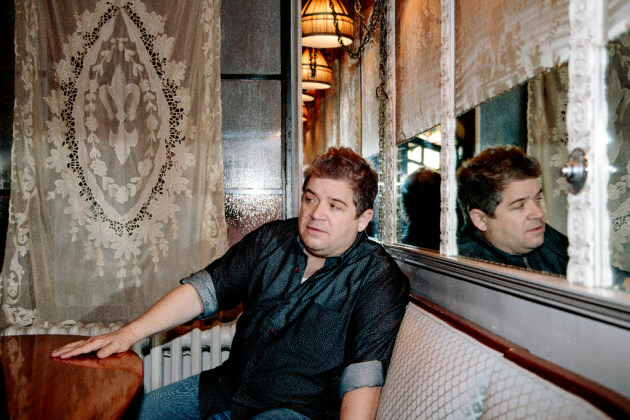 Unlike Bruce Wayne, who became an incredibly fit vigilante after the murder of his parents, Oswalt has admittedly turned to booze, depression and packing on the pounds. "In real life, I think Bruce Wayne would have grown up to be Gotham's most annoying slam poet," he said, adding that his life had suddenly turned into "every ... '80s sitcom in which a widower is raising a daughter. Except my ... sitcom has no ... laughs." Maybe not naturally, but Oswalt has mined humor out of the most heartbreaking of circumstances, even the moments that involve his daughter. In the night's most memorable bit, he recalls successfully distracting young Alice on Mother's Day with games and activities, only to be thwarted by a well-meaning ticket taker at the airport who was under the belief that sharing her own, unshakable grief over the loss of a parent would somehow comfort the child. As the routine built, the woman with the thick Polish accent grew into an evil ghost who stands to ruin Christmas and Arbor Day by popping up in the oddest places with the greeting, "leeeeeetle guuuurl." It was comedy at its best, one that left you slightly uneasy at the outset, doubling over in laughter by the end. "Mystic Lake, thank you," he said, closing out the evening. "I needed this." It wasn't clear whether he was referencing the urge to talk openly about Trump or his wife. Either way, Oswalt's catharsis was a therapy session to remember.